That same day, we drove south to Brier Island. The southernmost island from the mainland that extends southwest into the Bay of Fundy. At the very southern tip of Brier Island is a narrow and long rock shoal called Gull Rocks. It’s all that sits between the powerful tidal currents in the Bay of Fundy and the Atlantic. After a night of camping, we carefully carried our boats down the slippery pebble beach down to Hog Yard Cove. Just a 15 minute paddle down and across the rocks, we eddy hopped behind some of the larger rocks while the water rose. Our first day was a bust for conditions in the race. It was completely blown out and resembled a boiling soup. That night we all gathered for dinner under a tarp set up on the back of the truck to hide from the steady mist and rain. With our gear thoroughly rinsed, we made the same trek down to the cove. This time the weather, swell, and tide all aligned to form a fantastic tide race. It was a vast, wide feature with a tricky and glassy front wave that pulsed with the opposing ocean swell. Getting to the front required some crucial eddy hops, attaining enough to land right on the glassy face. Then carving to stay on top of the wave, moving and feeling how the current and swell were working together. Too far down in front and it’s an almost flat green wave, too far back and you’ll miss the next build up. And behind it is a wave train of even larger breaking waves. Finding the balance point and rhythm of the wave was a blast, but that had nothing on the local seal colony. There was a fairly large audience of seals that can be seen in the back ground of some of these photos. They would gather along far away eddy lines and watch from a distance. I even had one surf nearly next to me, and at one point I felt it brush against the chine of my kayak. This trip I used my 2pc. Storm MCS 203cm. 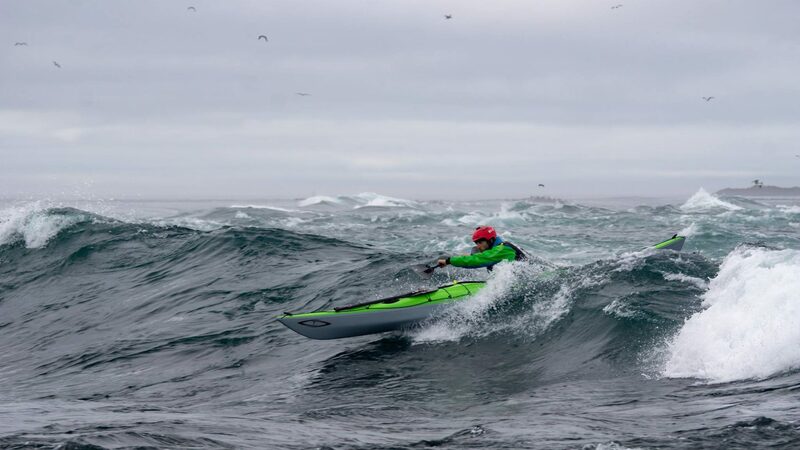 A favorite of mine for sea kayak surfing. The blade shape is just the right size for powerful accelerating strokes and moving on wave. Its shape gives precise control without any fight and I can make micro adjustments and transitions between strokes and the paddle just goes where I want it to go.